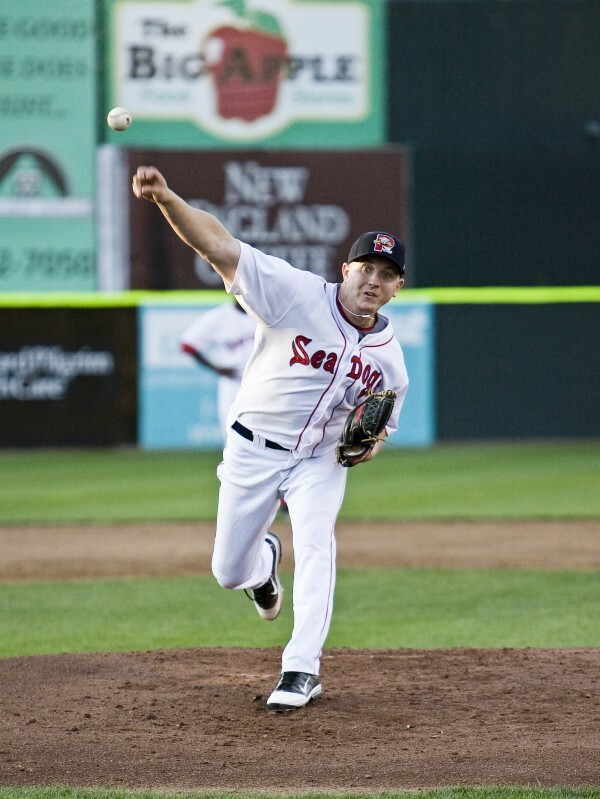 Brock Huntzinger of the Portland Sea Dogs has made the successful switch from starting pitcher to closer as he pursues his goal of reaching the major leagues. PORTLAND, Maine — Brock Huntzinger had come to a crossroads in his career. After four starts for the Eastern League (AA) Portland Sea Dogs last spring, he was frustrated. He had been hit around and felt his career was stalling out at the age of 24. “I’d have two good innings and then I’d blow up in the third inning and give up four or five runs and throw 50 pitches,” recalled Huntzinger. He sought out pitching coach Bob Kipper. Red Sox director of player development Ben Crockett was in Portland at the time and Huntzinger was summoned into a meeting with Crockett, Sea Dogs manager Kevin Boles and Kipper. He became a reliever and, between 38 appearances with Portland and two with Pawtucket, he compiled a 4-5 record with a 4.01 earned run average and six saves. He was used primarily in middle relief. This season, he has been the closer and, entering Wednesday night’s game against New Hampshire, was tied for second in the league with 11 saves. Binghamton’s Jeff Walters leads the Eastern League with 12. The 6-foot-3, 200-pound righthander has appeared in 20 games covering 23 ⅓ innings. Huntzinger has 16 strikeouts and nine walks while allowing 19 hits. Opponents are hitting just .224 against him and he has a 3.09 ERA. In his last 10 appearances, he has seven saves and a sparkling 1.54 ERA. “Relieving has been real good for me,” said Huntzinger. “I’ve responded well to it. I like pitching every night and at the end of the game. It fits my personality a lot better. He had always been a starting pitcher and was drafted in the third round (114th overall pick) by the Boston Red Sox in 2007. He had gone 7-1 with an 0.29 ERA as a senior at Pendleton Heights (Ind.) High School. He struck out 95 and walked seven. He also had two saves. He had planned to pitch at Indiana University but decided to sign with the Red Sox instead, earning a $225,000 signing bonus. He made his debut with the Gulf Coast League Red Sox on Aug. 9, 2007. He made four appearances that year. He gradually worked his way up to AA, making his debut with the Sea Dogs in 2011. He went 5-11 with a 6.17 ERA. Huntzinger features a live fastball, slider and an occasional changeup. He added that his slider is his “go-to” pitch but he won’t use his changeup very often. “It’s my third pitch and I don’t want to get beat because I threw a changeup,” said Huntzinger, who will turn 25 on July 2. He has been happy with his season to date but he said that he isn’t enamored with being in AA at this stage in his career. He feels he has a better shot to make it to the big leagues as a reliever than as a starter. What does he think it will take to reach the major leagues? “An opportunity. I think I can get AAA and major league hitters out. But I’ll need an opportunity,” he said.